On the 22nd of November 2014 a fantastic conference about software testing – PHP T-Day – took place in Belgrade, organized by PHP Srbija. Both Tihomir and Miloš were there and had the chance to talk to two awesome guys whose point of view on IT you really want to hear. 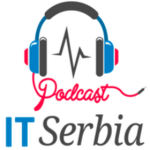 IT Serbia Podcast brings to you an exclusive interview with Sebastian Bergmann, the author of PHP Unit and Michelangelo van Dam, the president of PHP Benelux. Great conference! It was very interesting and inspiring to listen these guys last week.